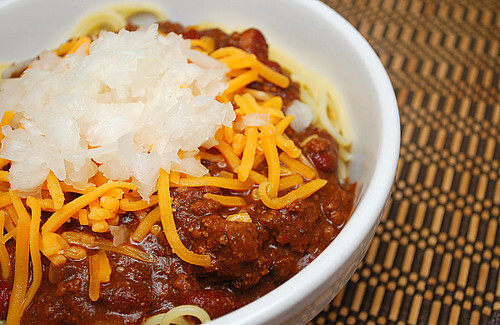 If you're looking for a unique chili recipe, the Cincinnati Chili version is definitely different and unlike other chili recipes. What makes it so interesting is the combination of spices which remind me of those used in Middle Eastern cuisines. It's not even served like your average American chili. Instead it's best over spaghetti and topped with garnishes like kidney beans, shredded cheese and diced onions. This Cincinnati Skyline Chili is excellent when prepared in the Instant Pot and one I highly recommend, even if you've never been to Cincinnati to have the authentic version! I have some friends who swear the secret to their chili recipe is in the spices. Well, that certainly applies when making Cincinnati Chili because the blend of spices used is important and will definitely affect the end result. The ground beef is browned then cooked with the spices (chili powder, oregano, cocoa powder, cinnamon, cayenne, allspice...) along with garlic until fragrant, which sets the flavor base of the chili. It's then left to pressure cook with tomato sauce, broth, water, vinegar and sugar to absorb all the flavors. I will admit I added the beans to the chili to simmer, but the authentic version uses the beans as a garnish or accompaniment. Feel free to hold off on the beans and add them as a garnish instead if you desire. This chili is truly delicious and is a favorite at our house. It makes a nice batch enough for 6-8 people so if you have a small household like ours, leftovers freeze beautifully and are even more delicious the next day. Press SAUTE on the IP and add 2 tablespoons olive oil and onions; cooking until softened. Add the ground beef to the pot. Saute the beef and break up the meat with a potato masher. Stir in the tomato sauce, broth, water, vinegar, sugar, and drained beans scraping the pan bottom to remove any browned bits. When the IP beeps after pressure cooking for 20 minutes, allow your IP to naturally release pressure for 15 minutes. While naturally releasing pressure (also known as NPR or NR), the display will reflect numbers counting up from 1. The numbers indicate how many minutes the IP has stopped cooking since it beeped (or how many minutes it has been naturally releasing pressure). No need to touch your IP while it naturally releases pressure. The pin at the top of your IP will drop when all pressure has been released and it's safe to open. When the display reflects L15:00 (which is 15 minutes since the IP has beeped), turn the setting on top of your IP to VENTING. Doing so allows the IP to quickly release any remaining pressure (also known as QPR or QR). I use a wooden spoon to carefully turn the setting to avoid close contact with the potential steam. You may also want to turn your IP away from cabinets to allow the released steam to escape freely. The pin at the top of your IP will drop when all pressure has been released and it's safe to open. Press SAUTE on IP and season with salt and hot sauce to taste.